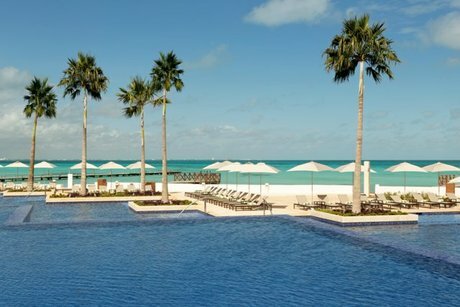 All-inclusive luxury has been redefined with an incredible resort in the most coveted location of Cancun. Inspired by the beauty and culture of the destination, a naturally elegant and airy ambiance blends contemporary décor with Mayan influences. Swim-up suites and authentic cuisine are just a few of the many delights awaiting guests at the oceanfront Hyatt ZivaTM Cancun. 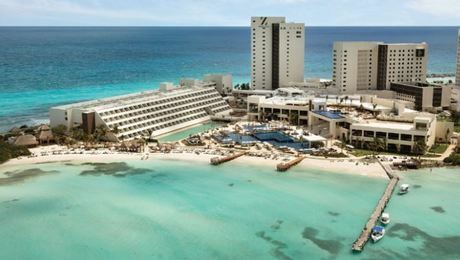 Ideally situated in Cancun’s more desirable location, Hyatt Ziva Cancun stands on the edge of a picturesque peninsula, the only resort in the region surrounded on three sides by the sparkling Caribbean Sea. The beachfront resort is adjacent to the city’s vibrant entertainment district and just 25 minutes from Cancun International Airport. LA BASTILLE | Classic and romantic, this elegant yet relaxed adults-only restaurant serves timeless French cuisine. EL MERCADO | With indoor and outdoor seating, this international buffet offers an endless variety of gourmet dishes to please any palate. THE MOONGATE | From dim sum to stir-fry and teppanyaki, an array of Asian delights awaits you. TRADEWINDS | A casual grill by day and a classic steakhouse by night, this oceanfront eatery offers fantastic views indoors and out. LORENZO’S | Featuring Italian staples such as wood-fired pizza, this restaurant serves trattoria-style favorites for lunch and becomes an elegant ristorante for dinner. HABANEROS | Delicious tacos, fresh ceviches and Mexican paletas are served right on the beach, accompanied by amazing ocean views. (Different dress codes for lunch and dinner). CHEVY’S | This classic American diner is the perfect place to grab a burger and a shake. PASTELES | Sweet treats take center stage at this colorful dessert parlor serving up ice cream, pastries, cotton candy and more. CASA DEL CAFÉ | Espressos, cappuccinos and other delicious beverages are complemented by scrumptious pastries and snacks at this cozy café. 24 HOURS | Enjoy a cool beverage and a snack in this lounge open 24 hours a day. TRES CERVEZAS | This sports bar features its own microbrewery and brewmaster. With handcrafted beer and wings, there’s no better spot to catch a game. 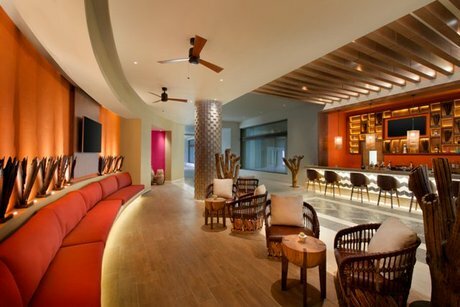 SAASIL BAR | Relax within this breezy, contemporary lounge inspired by the region’s Mayan heritage, or sit outdoors and take in the stunning ocean views. JUANA MARGARITA | Get a taste of Mexico by sampling a selection of local tequilas. PUNTA VISTA | Admire the panoramic views from the rooftop as you sip a signature cocktail by the adults-only pool. DIPS & SIPS | Enjoy a drink poolside or within the pool at the swim-up bar and take in vistas of brilliant ocean blue waters. BAR DEL MAR | Sip a refreshing drink while relaxing poolside. THE CLUB | Whether lounging indoors or seated outside, savor a delicious snack with a fine wine or premium cocktail. FOOD CARTS | Roaming the pool and beach areas throughout the day, traveling food carts offer delights such as tacos, burgers, fresh fruit and sweet crepes. 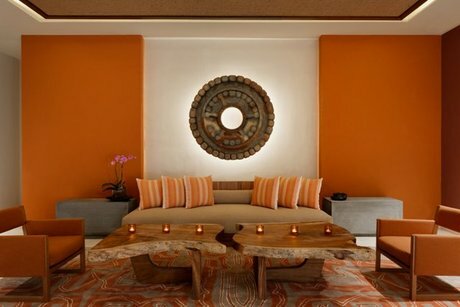 Hyatt Ziva Cancun is the best Cancun lodging choice for your trip to Mexico. With numerous amenities for guests such as room service, car rental, 24 hour front desk, you will wake up at Hyatt Ziva Cancun feeling invigorated every day for your time in Cancun. Don’t let this amazing reservation opportunity pass you by, book your stay at Hyatt Ziva Cancun today to make the most of your time in Cancun, Mexico.